Well, here goes. I've mapped out six, research-based polestars that should help guide you to some reasonable conclusions about homework. How much homework do U.S. students get? The best answer comes from something called the National Assessment of Educational Progress or NAEP. In 2012, students in three different age groups — 9, 13 and 17 — were asked, "How much time did you spend on homework yesterday?" The vast majority of 9-year-olds (79 percent) and 13-year-olds (65 percent) and still a majority of 17-year-olds (53 percent) all reported doing an hour or less of homework the day before. Another study from the National Center for Education Statistics found that high school students who reported doing homework outside of school did, on average, about seven hours a week. If you're hungry for more data on this — and some perspective — check out this exhaustive report put together last year by researcher Tom Loveless at the Brookings Institution. An hour or less a day? But we hear so many horror stories! Why? The fact is, some students do have a ton of homework. In high school we see a kind of student divergence — between those who choose or find themselves tracked into less-rigorous coursework and those who enroll in honors classes or multiple Advanced Placement courses. And the latter students are getting a lot of homework. In that 2012 NAEP survey, 13 percent of 17-year-olds reported doing more than two hours of homework the previous night. That's not a lot of students, but they're clearly doing a lot of work. That also tracks with a famous survey from 2007 — from MetLife — that asked parents what they think of their kids' homework load. Sixty percent said it was just right. Twenty-five percent said their kids are getting too little. Just 15 percent of parents said their kids have too much homework. Research also suggests that the students doing the most work have something else in common: income. 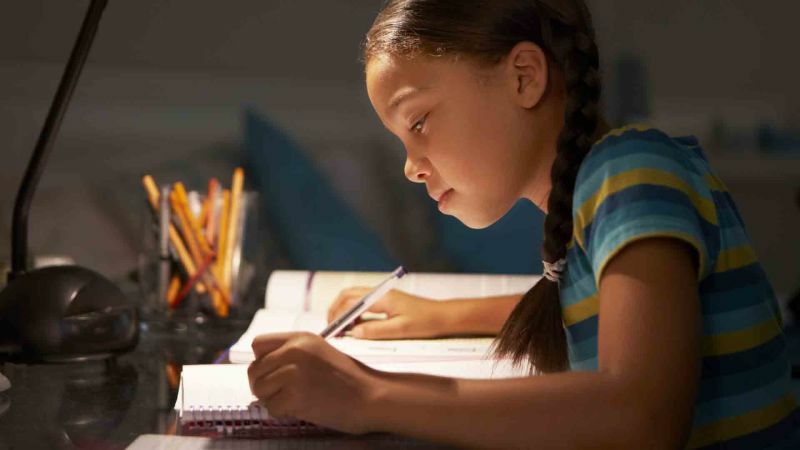 "I think that the debate over homework in some ways is a social class issue," says Janine Bempechat, professor of human development at Wheelock College. "There's no question that in affluent communities, children are really over-taxed, over-burdened with homework." But the vast majority of students do not seem to have inordinate workloads. And the ones who do are generally volunteering for the tough stuff. That doesn't make it easier, but it does make it a choice. 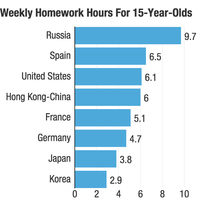 Do we know how much homework students in other countries are doing? Sort of. Caveats abound here. Education systems and perceptions of what is and isn't homework can vary remarkably overseas. So any comparison is, to a degree, apples-to-oranges (or, at least, apples-to-pears). A 2012 report from the Organisation for Economic Co-Operation and Development pegged the U.S. homework load for 15-year-olds at around six hours per week. That's just above the study's average. It found that students in Hong Kong are also doing about six hours a week. Much of Europe checks in between four and five hours a week. In Japan, it's four hours. And Korea's near the bottom, at three hours. Better yet, how much is just right? Harris Cooper at Duke University has done some of the best work on homework. He and his team reviewed dozens of studies, from 1987 to 2003, looking for consensus on what works and what doesn't. A common rule of thumb, he says, is what's called the 10-minute rule. Take the child's grade and multiply by 10. So first-graders should have roughly 10 minutes of homework a night, 40 minutes for fourth-graders, on up to two hours for seniors in high school. A lot of of schools use this. Even the National PTA officially endorses it. Homework clearly improves student performance, right? Not necessarily. It depends on the age of the child. Looking over the research, there's little to no evidence that homework improves student achievement in elementary school. Then again, the many experts I spoke with all said the same thing: The point of homework in those primary grades isn't entirely academic. It's about teaching things like time-management and self-direction. But, by high school the evidence shifts. Harris Cooper's massive review found, in middle and high school, a positive correlation between homework and student achievement on unit tests. It seems to help. But more is not always better. Cooper points out that, depending on the subject and the age of the student, there is a law of diminishing returns. Again, he recommends the 10-minute rule. This is where things get really interesting. Because homework should be about learning, right? To understand what kinds of homework best help kids learn, we really need to talk about memory and the brain. Let's start with something called the spacing effect. Say a child has to do a vocabulary worksheet. The next week, it's a new worksheet with different words and so on. Well, research shows that the brain is better at remembering when we repeat with consistency, not when we study in long, isolated chunks of time. Do a little bit of vocabulary each night, repeating the same words night after night. Similarly, a professor of psychology at Washington University in St. Louis, Henry "Roddy" Roediger III, recommends that teachers give students plenty of little quizzes, which he says strengthen the brain's ability to remember. Don't fret. They can be low-stakes or no-stakes, says Roediger: It's the steady recall and repetition that matter. He also recommends, as homework, that students try testing themselves instead of simply re-reading the text or class notes. There's also something known as interleaving. This is big in the debate over math homework. Many of us — myself included — learned math by focusing on one concept at a time, doing a worksheet to practice that concept, then moving on. Well, there's evidence that students learn more when homework requires them to choose among multiple strategies — new and old — when solving problems. In other words, kids learn when they have to draw not just from what they learned in class that day but that week, that month, that year. One last note: Experts agree that homework should generally be about reinforcing what students learned in class (this is especially true in math). Sometimes it can — and should — be used to introduce new material, but here's where so many horror stories begin. Tom Loveless, a former teacher, offers this advice: "I don't think teachers should ever send brand-new material that puts the parent in the position of a teacher. That's a disaster. My own personal philosophy was: Homework is best if it's material that requires more practice but they've already received initial instruction." Or, in the words of the National PTA: "Homework that cannot be done without help is not good homework."